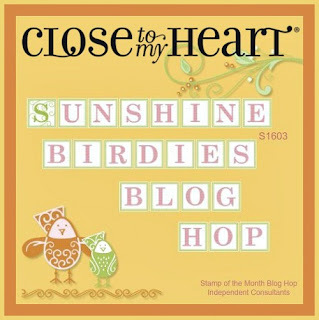 Welcome to the March SOTM Blog Hop featuring our exclusive Sunshine Birdies stamp set! If you have come here from Lisa's Blog you are on the right track. You can find the complete listing of participating CTMH Consultant bloggers here. This stamp set is such a cutie that I knew I was going to have to doing something fun with it! I made a center stair step card with our Penelope Paper Pack and added lots of the images stamped in Memento ink and colored with our Shinhan Markers to create a fun scene. 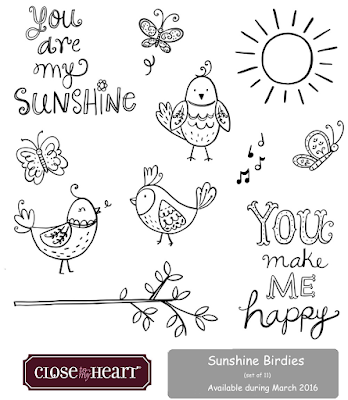 I love having sentiments that you can partially color to make them pop - this stamp set has two! For some extra dazzle I added our Green Shimmer Trim and a couple of the Enamel and Glitter Hearts. I cut out two of the clouds from one of the PML card paper that comes with this kit and attached them to the very back of the card - this shot shows the fun 3-D effect you can get with this style of card. 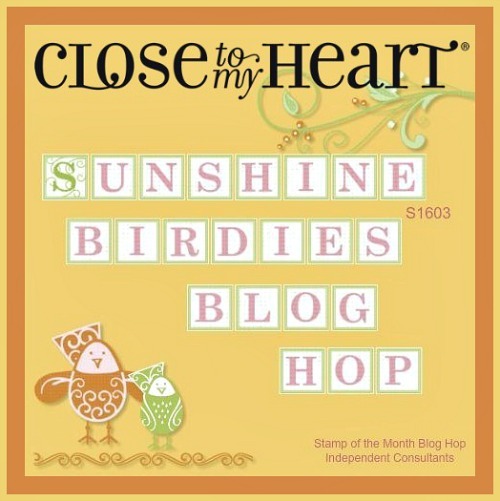 Now hop on over to Donna's Blog and see what she has created to share with us! Fabulous & Fun Card! Love the fun fold and how you incorporated so many stamps onto one project. Love the fold and all your coloring! Fantastic job! So fun and colorful! I love it! I love everything about this card! The colors, the design, the coloring! It's truly beautiful! Adorable use of images and colors! This is a very cute card. Thanks for sharing. Soooo cute! Love your coloring with the markers.